This finely made sword is of the Oakeshott type XIX, with a broad flat blade with parallel edges and narrow fullers. The original sword is inscribed with the date 1432, and is believed to have come from the treasuries of Alexandria. Based on a famous museum piece found in the Royal Armouries, in Leeds, West Yorkshire, England, this 1432 Milanese Sword with Finger Guard is a part of the Primus collection, as well as stunning recreation of the Type XIX Oakeshott style sword. Possessed of a truly unique form, this sword has all the look of a classic medieval weapon, but with a stylish fencers touch, to help alter the grip, while also changing and enhancing its appeal. Definitive as a Type XIX, this sword features parallel blade edges, along with a distinctive hexagonal cross-section. A short ricasso, complete with short triple fullers to help lighten the swords weight, adorns the blade as well (the central fuller, though, is longer and runs down about half the blade), while also providing a safe place to rest your finger for a blade- forward hold. The blackened guard features straight-edged quillons, as well as a single blade-curved quillon on the ricasso, which provides an extra finger-loop, for a variant on the traditional longsword stance. The sword also features a textured, leather wrapped hilt, and a wide, round pommel. Included with the sword is a matched wood scabbard, also wrapped in leather and adorned with twin hanging rings on each side of the scabbards mouth. 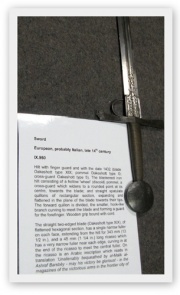 The unique twist on this 1432 Milanese Sword with Finger Guard makes it a fine choice as a collectible, especially when you consider that its twin (on which it is based) rests in the possession of the Royal Armouries, in Leeds. It is also a very unique look on the form of swords through the ages, as well as a fine blade to have hanging at your side, too. The Primus range represents the pinnacle of Deepeeka quality historical replicas. Each item of this signature line is developed from original design patterns in consultation with the museum staff who have direct access to the original pieces. Additional production development is done with assistance from American and European experts in the field. Only then are these pieces painstakingly created by the finest of Deepeeka’s skilled craftsman. Final quality control is double checked to insure the strictest adherence to even the slightest of details. Deepeeka Exports is extremely proud and pleased to offer the Primus line as the culmination of years of continuing dedication to quality and historical accuracy in these fine products. There are tales of Alexandria's lost glories. Many of those stories speak of the libraries; there was also a treasury of weapons, starting around 1367. Captured weapons and armour were stored there, as curiousities and valued prizes. During the Crusades, while Europeans were attempting to re-gain access to Jerusalem, many wealthy and well-provisioned soldiers and knights crossed the land near the Mediteranean Sea to do battle. Some lost their lives, and all their gear. The metal bits and pieces were a marvel to the residents, and were carefully stored. Later, some of these pieces that had been moved to Alexandria were given as bond on treaties with other nations. They were often inscribed with dates or names in the script of the receiving nation. The Finger Guard Hilt Milanese Sword is a reproduction of the straight two edged sword, dated 1432, in The Royal Armouries, Leeds, UK. This sword, one the most famous swords from Alexandria, is representative of the Oakesott Type XIX, with these defining characteristics: the parallel edges of the blade, hexagonal blade cross-section, and short ricasso. This page was last modified on 30 May 2014, at 19:26. This page has been accessed 5,274 times.